UNITED NATIONS -- International Atomic Energy Agency (IAEA) Director General Yukiya Amano said Thursday that North Korea is a global threat, more today than ever. "Our inspectors were requested to leave in April 2009 ... after that we don't have inspectors on the ground, but we continue to monitor the nuclear programs of North Korea by using satellite imagery and collecting open source information, and we have observed the progress in the nuclear program in North Korea in particular in the city of Yongbyon," he told CBS News on Thursday. "North Korea is not a member of the IAEA now, we need the authorization from a policymaking organ, but when we get the 'go' sign, we can move rather quickly," Amano said. Amano, since last summer, has organized a team at the agency, ready to be on the ground "on short notice" if there is a diplomatic resolution. "We think our involvement is indispensable, verification is a very important part," Amano said, "We have experts, it's a small team, but expertise is very, very important, and these are the people who were in North Korea before, so we don't want to lose the knowledge." North Korea, formally known as the Democratic People's Republic of Korea (DPRK), announced its withdrawal from the Nuclear Non-Proliferation Treaty in 2003. In recent years, the nuclear tests and missile launches have advanced its nuclear program dramatically. Scott Snyder, senior fellow for Korea studies and director of the program on U.S.-Korea policy at the Council on Foreign Relations told CBS News, "There is a potential role for IAEA, as there was under the Geneva Agreed Framework for inspectors, to conduct verification activities inside North Korea." "Most probably, it would be an implementing role that would authorize IAEA participation following the conclusion of a new US-DPRK understanding, if such an understanding can be achieved," Snyder said. On Friday, Amano told the U.N. General Assembly that he is "seriously concerned" about North Korea's nuclear program and urged Pyongyang to "comply fully with its obligations under all relevant resolutions of the Security Council and the IAEA." Trump urges North Korea to "make a deal"
Speaking in Seoul on the achievements of South Korea and the oppression of the North Korean government, President Trump pivoted from fiery threats against the government of Kim Jong Un, to an open offer to negotiate the denuclearization of the Korean Peninsula. In China, Mr. Trump implored its newly-strengthened leader Xi Jinping, for more help to reign in Kim Jong Un's nuclear ambitions. Amano said that, this past summer, he created North Korea "team" at the IAEA, to be ready to go back to North Korea, when and if the time comes, including training of inspectors and creating a possible verification plan. That said, Amano has been dark in his assessment about the threats posed by the government in Pyongyang: "The nuclear test it conducted in September, its sixth and largest to date, was extremely regrettable." Many experts in nuclear non-proliferation, as well as policy experts, believe that the best-case scenario for a diplomatic solution will be to bring North Korea into an inspection program that limits its nuclear and ballistic missile testing, rather than in the hope that North Korea will abandon its nuclear program altogether. Retired General Michael Hayden, former director of the U.S. National Security Agency and the CIA, is one of those who believes that denuclearization should not be the goal: He said last week that the chances of North Korea actually denuclearizing are "near zero. Despite the defiance of North Korean leaders, the sanctions and tough enforcement are beginning to have an impact. Amano says that the IAEA is already observing North Korea, collecting all the information available, including satellite imagery and vessel tracking software. Snyder said that the IAEA record from the 1990s on North Korea created distrust in Pyongyang, because the inspections brought to light North Korea's initial discrepancies and cheating. "My guess is that in the low-likelihood event that the U.S. and North Korea can negotiate an understanding going forward, the U.S. will want to call upon the verification and implementation monitoring skills and capabilities that the IAEA is best suited to provide ... An IAEA role in this context could last for a very long time." But Amano has been clear: "We remain ready to contribute to its peaceful resolution by resuming our verification activities in the country once a political agreement is reached among countries concerned." 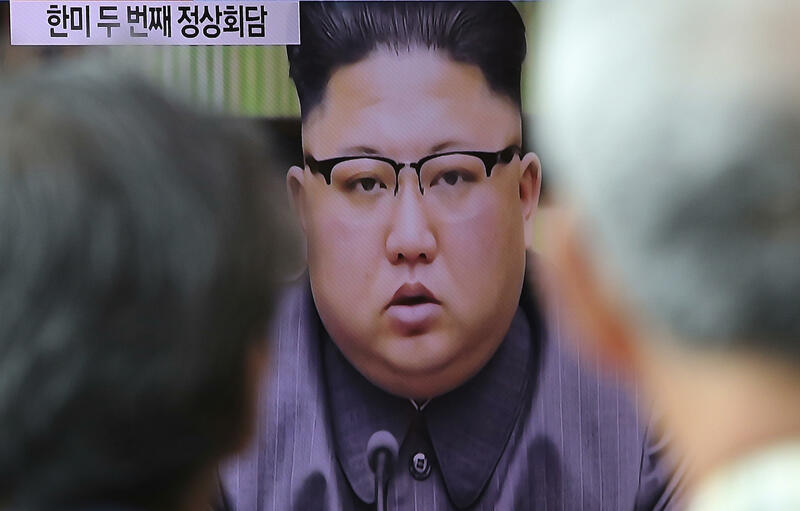 Tamping down expectations of a settlement soon, North Korea responded to Amano on Friday at the U.N., calling his report a "seriously distorted picture of the reality regarding the nuclear issue on the Korean peninsula." North Korea's Ambassador Ja Song Nam said that his country is a "responsible nuclear state" that will "make a positive contribution to ensuring peace and security in the Korean peninsula" and called the U.S. a "nuclear war criminal." "The DPRK will neither put its nukes and ballistic missiles on the negotiating table in any case unless the hostile policy and nuclear threat of the U.S. against the DPRK are thoroughly eradicated," the North's U.N. envoy said.